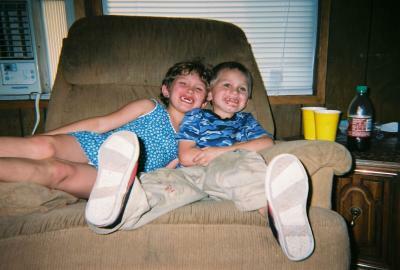 Trevor with his big sister Jessey before he started Adderall. What have you done to my little boy? Now that he's taken you! A Beautiful Boy with A.D.H.D. He once was happy and full of glee. That was before 'YOU' he did greet. I remember when he was sweet. Now only sadness and crying replace his smiles . God how I wish I could fight for him back! But how do you fight ADHD anyway? Why aren't you working like the Doctors said? Instead you have taken my child away! He has entered into a mindless state. I will forever watch over you. Even when you're feeling so blue. Trevor has been taken off Adderall. I am Happy to say we have our little boy back. Thank you so much for a beautiful but sad poem! I am so glad you have your Trevor back... sounds like, for HIM, that medicine was just an awful one. Thank goodness he has YOU to fight for him. What a wonderful mom... what a wonderful poem! Thank you for sharing. When ritalin didnt work, dr said adderall. When he became overly emotional, she said give him more. A week off stimulants and he still has a blinking tic, closes his eyes a lot, especially in school and he puts his head down on the ground at recess and plays with dirt. He crouched down on the ground twice when exiting a church service with the church people standing on either side and people behind us filing out. He jerks his shoulder away and looks and touches the spot when other people touch him. This behaviors all began with 7.5 mg of adderall twice a day, continued when switched back to ritalin for 9 days and continue now a week later. The Dr. says everything but the tic is to get attention. My son gets plenty of attention. The psychiatrist says intuniv, dilate his blood vessels, maybe that will help. One dose and he is lethargic and dull. Drs say that's normal keep giving it. I miss the way he was before adderall. Hi there,i want to applaud you for posting your poem for others to see.I started taking adderall at 13.I am now 25 years old and will soon be entering my 2nd rehab.If my story helps one person than my life purpose is been complete.As many others have experienced being on adderall soon becomes a nightmare,and you are living in hell.pharmaceutical companies are making billions of dollars putting this lethal lethal lethal drug into children as young as FOUR.I can only speak for myself(and quite a few of my friends and family),please stay away from this medication,please keep your children away from this medication i beg of you.thank you for reading. Join in and write your own page! It's easy to do. How? Simply click here to return to Inspirational Or Funny SPD Stories.